The average gold panner or metal detectorist will carry several tools to aid his or her treasure hunting adventures. It goes without saying that one of the best new products we have tried is the new Gold Rush Nugget Bucket as seen on ABC’s: Shark Tank. At first glance, the Gold Rush Nugget Bucket may look like a 5-gallon bucket, but it’s so much more! We tried taking out the Nugget Bucket with our waterproof Garrett AT Pro Metal Detector to test the operation of both units together and we were surprised by the results. 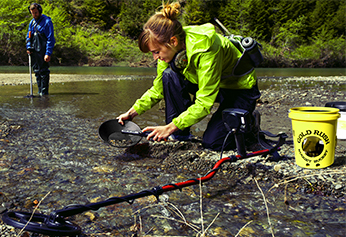 The first step you want to do when panning with the Gold Rush Nugget Bucket is to hit a solid tone target with your metal detector. Using a shovel or handheld digging tool, dig a nice size plug of soil at the target depth as displayed on your metal detector. Since we were digging in thicker soil, we set the plug to the side on a towel. Run your handheld pinpointer inside the exposed hole to ensure you didn’t miss anything. Once you verify your target is in the plug of soil, drop it into the Gold Rush Nugget Bucket top screen. Next, pour water over the dirt and use your hand to shake away clumps. This is where the magic of the Gold Rush Nugget Bucket starts taking place. Larger objects will often get caught up in the top screen while the smaller pieces flow through the Gold Rush Nugget Bucket’s patented chamber system. The objects caught in this phase are often easy to catch, but if you are digging in thicker soil and can’t identify your target just run your pinpointer over the top of the screen until you get a solid signal. Note: Since the Gold Rush Nugget Bucket is made up of plastic parts, only metal targets will sound off on your pinpointer. Next, remove the top screen to expose and inspect the lower screen. Similar to the top screen, you will want to flush any material left in the lower screen by adding more water. We found many smaller objects that normally not have caught using the Gold Rush Nugget Bucket. Some objects include gold, a Native American arrowhead, a piece of an old suit button (plastic), and several brilliant looking rocks/gemstones. Additionally, the bucket was very useful in separating multiple targets such as junk like pull tabs, nails and other annoying objects, which as many know in the detecting industry as our worst nightmare. Overall, using the bucket was fun and made us think of all the countless times we may have missed non-metallic or tiny objects that can’t be picked up by a detector. Intended for the purpose of finding gold nuggets and find gold, the Gold Rush Nugget Bucket is also the perfect tool for finding extremely small jewelry, coins, loose gemstones on rings, artifacts and much more! The lightweight and self-contained Gold Rush Nugget Bucket had all the features packed into a single well-built design and was so easy to use that a child could operate it. We couldn’t help but think how perfect the bucket would be for gold detecting in areas like Alaska and Norther California where detecting and gold panning go hand in hand. Lastly, you can bring your own water! Load up on gallon jugs of water and pour as needed and the Gold Rush Nugget Bucket will do the rest for you. To watch a detailed video of how the Gold Rush Nugget Bucket catches small gold dust and gold flakes view this video and description and see how it works.